1) Screen resolution on widescreen Android phones has been improved. You will now always use the full height of your phone. 2) Deploy Cannons has had its cost raised from 3 to 4, and is now banned from use in Limited. For a more detailed discussion of this change, please read: Kingdoms Update: Deploy Nerfgun. 3) The promo version of Queen of Dragons has been fixed. 4) A bug that showed Steelbane Overwatch having a cost of less than 4 while in play has been fixed. 5) We have deployed all of the necessary code for release on iPad. We will be launching the game on iTunes shortly! Hello all. I hope everyone is enjoying 2016 so far. The focus of this blog post will be to update you as to where we are with Kingdoms and deal with the key problem card in the game right now. First things first: Deploy Cannons is being nerfed. When first released it was quickly determined to be a powerful card, and founds its way into numerous decks, but definitely wasn't dominant. With the release of MEK it saw even more play combined with Shrapnel Cannon, but the strength of MEK's nemesis Bothar kept it in check. 2K saw its range limited, but also reduced the number of answers that many decks had. 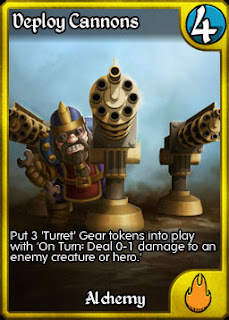 The recent upgrade to Olfaan was the final straw, with Deploy Cannons becoming a defacto part of decks at levels not seen since the original Manacycle Wizard. On Monday (possibly Tuesday) we will be releasing a small patch to fix some bugs and Android issues, as well as prepare for the iPad release. 1) Deploy Cannons will be banned in Limited. Limited decks have far fewer answers to multiple gear, and hence spamming two or three copies of Deploy puts the opponent in a near unwinnable position. 2) Deploy Cannons cost will be raised from 3 to 4. This is a fairer cost for a card that offers repeatable damage and requires no set up. This change should have the added benefit of slowing down Olfaan who, as anyone who has been playing regularly will know, has moved from the least played, poorest win % hero, to the most played, best win % hero in one very big jump. 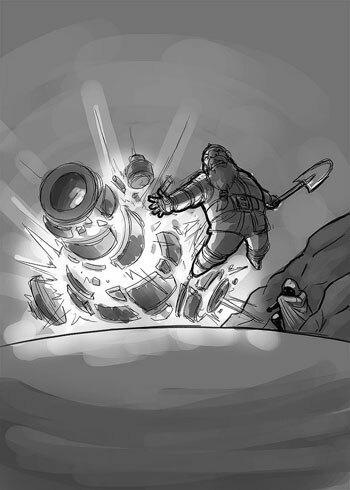 It is amazing that simply removing the randomness from his abilities would have this great of an effect, and we will be continuing to watch this hero closely. 1) Apple has begun reviewing the iPad version of Kingdoms CCG today. Our first submission has changes requested, and we submitted those last week. We expect to hear from Apple early next week and if this version is approved we'll be live soon after! 3) We're finalizing our plan for the year right now and when complete we will be able to you all a more clear vision of what will be coming out when throughout the year. We've heard your request for more transparency as to release dates, marketplace changes and prizing changes and it is our plan to provide you with this information in 2016.